It’s a good few weeks since I’ve been in this part of town so this could be pretty old news. But worth mentioning nonetheless. The last remaining city on the giant coffee house bingo card can be crossed off. 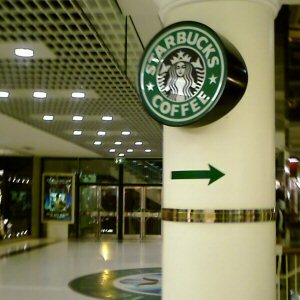 Stoke-on-Trent finaly has a Starbucks! I had to double-take when I saw this walking through the Potteries Shopping Centre in Hanley but the arrow did not mislead. A few seconds later I was handing over two quid and change for a very, very large cup of coffee. Bliss. There’s a price to pay though. It’s taken over the entire food court, so Stoke now has a different dubious honour: it’s the only city in the UK without a Burger King. Still got the one at Freeport or does that not count? It’s close enough, give that man a royale with cheese.